“Not so much a library… more a way of learning” proclaims the 1977-vintage pamphlet on the then newly opened Learning Resource Centre (LRC). Forty years on, it’s a marketing soundbite that has remained truer to the ethos of the facility than perhaps its author could ever have envisaged. The institution’s original library was located inside the Link Building, but with the establishment of Plymouth Polytechnic in 1970, the need for a dedicated building became steadily more urgent. 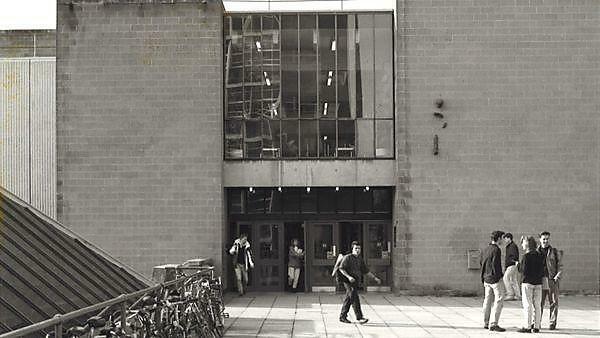 And in 1976, at a cost of £830,000, the first major campus capital development of the LRC and Students’ Union was completed, and opened by the Duke of Edinburgh. At that stage, the library housed 70,000 books, but as the polytechnic expanded to incorporate three other sites (Rolle, Seale-Hayne and Exeter), so that figure rose to 500,000. That £7 million extension – formally opened in January 2005 – increased the library’s footprint by 60 per cent and enabled it to make fundamental changes to the learning environment. 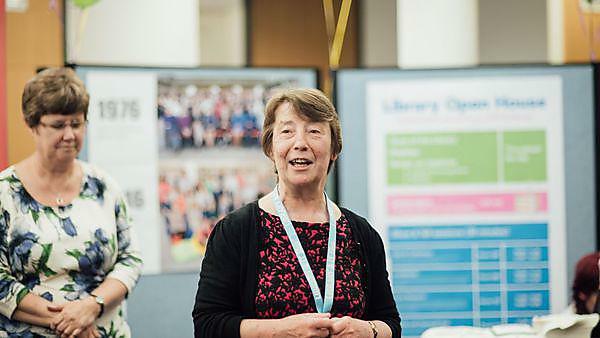 There are now 350,000 books and an average daily footfall of 5,000 people (one million per year), who come for a much wider range of services such as large-format printing and print finishing services, the SUM:UP mathematics drop-in centre, and the open-access computing area. Those changes have often revolved around the ethos of ‘self-service’ – such as when, after much debate, the decision was taken in the mid-1980s to take the computer reference system used by staff and ‘turn it around’ to face the students so they could see for themselves whether the book they wanted was available or on loan. And then there was the scrapping of fines in 2013 (for all but a few exceptional instances), a change in approach that has subsequently been adopted by a number of other institutions. Further evidence of that forward thinking, and the positioning of the library as a learning resource centre, came in 2011–12 when the team began to provide a staffed service 24 hours a day, 365 days a year – even Christmas Day – a change that is still one of the most positively commented upon aspects of university life in student surveys. And then there are the technological advancements that the library has accommodated, such as the innovative e-Textbooks project, or the integration of the library’s Primo catalogue into the Digital Learning Environment, enabling students to search for books, journals and electronic resources on the move. Plenty of people did step foot in the library, however, on 6 June for the 40th birthday celebrations. There were tours running all day, with some show-and-tell sessions including an introduction to the Special Collections, recent advancements such as e-textbooks, and the way the library supports research in the institution. And it wouldn’t have been a birthday without some cake.